The UK is festooned with campsites, and a great deal of those are award-winning sites decked out with plentiful facilities, such as toilets and hot water shower blocks, there to enhance your camping enjoyment. In fact, camping in the UK is a broad church, with the best campsites ranging from busy caravan parks to remote moorland expanses. Dig hard enough and you may come across a few ‘secret’ campsites; off-the-beaten track sanctuaries offering temporary escape from the bustle of modern life. 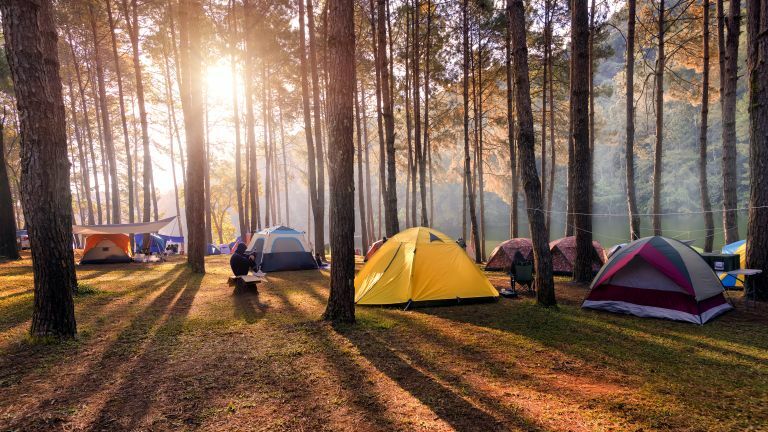 Each the best campsites in the UK featured here are considered gems in different ways, depending on what onsite facilities they offer, the surrounding areas and views, or who they are best suited to. If you’re looking for a dramatic spot with tip-top facilities then this National Trust-run site is one to remember, at the foot of the towering Langdale Pikes and ideally situated for excursions into the Lakes. A collection of wooden camping pods add a glamping option for those keen to avoid canvas, and there’s a bouldering wall and a children's play area, as well as the nearby Sticklebarn pub for a break from cooking on a stove. One for the family album, Toms Field is a place of beauty. A simple, no-frills campsite with unassuming toilet block nestled on the edge of a tiny Dorset village of Langton Matravers, just outside Swanage. However, two hidden gems elevate this place - one path leads straight to the Jurassic coast and Dancing Ledge, an amphitheatre of sport climbing around a solid rock sea-swimming pool, while a second path leads from the campsite across to the Square and Compass, a quirky, eccentric and cider-filled joy overlooking the sea. Set in the heart of the Peak District National Park, North Lees Campsite is located in a sheltered valley, near Hathersage and is within a short walking distance of Stanage Edge. A clean, well maintained site and the surrounding woodlands, farmland and moorland add up to a tranquil base to explore the delights of the wider Peak District. Popular with cyclists, climbers and walkers, it will be busy in the summer months, in spite of a 60 pitch size. A peaceful secluded site near Lewes has beautiful meadow pitches with attached camp fire pits and views of the South Downs. Aimed squarely at families, no cars are allowed onsite, so portable camping gear is the order of the day. However, the peace and quiet with no slamming doors in the night is something to treasure. Just an hour out of London, but existing in another time entirely, this working farm has a variety of unusual camping pitches scattered around the farm and buildings, as well as a sizeable field of more traditional spots. Fires are welcomed in the pits provided, and touring round the farm animals will keep the kids entertained. An atmospheric footpath walk through the woods of the Weald takes you to Groombridge, and a decent pub (The Crown Inn) on the green. If you’re big on trees, this is the campsite for you. Surrounded by sighing Caledonian pine trees, and a stone’s throw from a crystal-clear Loch, it’s a beautiful, tranquil spot in the Scottish Highlands. Just a few miles away the mighty Cairngorm mountains rear up, often snow capped, offering a challenge to walkers, climbers and ramblers alike, while off-road cyclists have some of the best terrain in the country to hand, not to mention the ski school in the winter months. Memorable for all the right reasons. A classic farm-style campsite set in darkest Cornwall, Mena farm is beautifully laid out, with purpose-designed camping pitches, outdoor kitchen areas and sparkling toilet blocks. Set on the edge of Bodmin moor in 15 acres of rolling Cornish countryside, it’s well positioned to enjoy the hotspots of Cornwall, without the hecticness that comes in peak visitor season. Without doubt one of the most dramatic locations in the UK, the Sligachan campsite is cheap, cheerful and visually stunning. There is Wi-Fi, the usual essentials, and most importantly the Sligachan Hotel just a few metres away, which houses an epic whisky collection and local ales. With views of the epic Cuillin mountains, and a likely dusting of midges in warm conditions, this is one to tell the grandchildren about.